The efficient production of compliant regulatory submissions is the goal of every regulatory operation. Having a single publishing solution that can effectively produce a variety of submission output formats provides a distinct advantage in terms of flexibility, training and total cost of ownership. Ennov Dossier is comprehensive and meets the most demanding requirements for regulatory submissions while still being intuitive and easy to use. 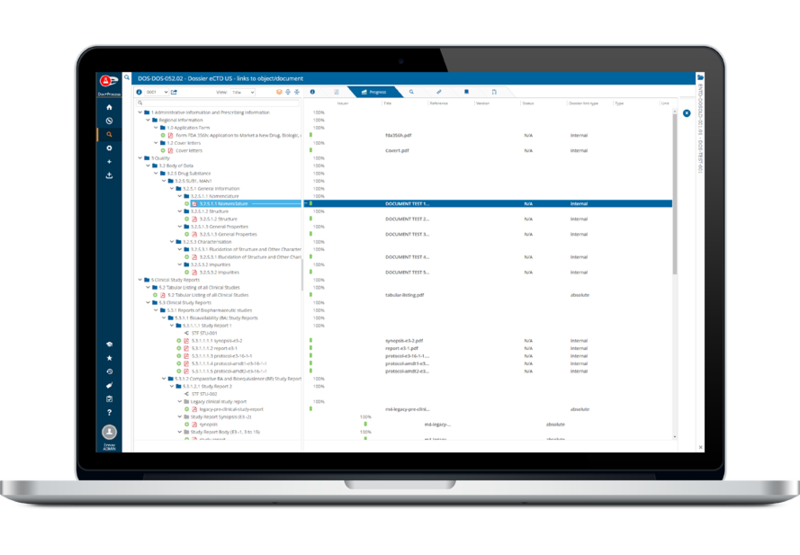 Ennov Dossier provides the ability to build, manage, publish, validate and archive regulatory dossiers using the native capabilities found within Ennov Doc. This eliminates the fragmented and inefficient processes of locating, copying and uploading the documents that you need for your regulatory submissions – providing a harmonized and seamless dossier publishing solution. A simple drag-and-drop interface allows publishers to link documents into submission assemblies quickly and easily. Ennov Dossier, when combined with Ennov Doc, provides the ability to manage your regulatory dossiers using all of the robust functionality of our comprehensive EDMS. Submission assembly templates are provided for the regions that accept eCTD submissions (e.g. US, EU, GCC, Canada, Swissmedic, TGA) as well as for other non-eCTD formats and can be modified to meet a client’s specific requirements. Ennov provides regular updates to these templates as the regulatory guidance changes. Ennov Dossier also provides the ability to create Tables of Contents, hyperlinks, bookmarks and other navigation aides to assist in the review of the dossier. During publishing all the necessary components for a compliant submission, including the required ICH and regional XML files, correctly named leaf files and folder structures are created.